On Friday June 27th, Keeping Rosy. a tense psychological thriller starring Maxine Peake (The Village, Silk, The Hollow Crown) and Blake Harrison (The Inbetweeners) hits UK cinemas. 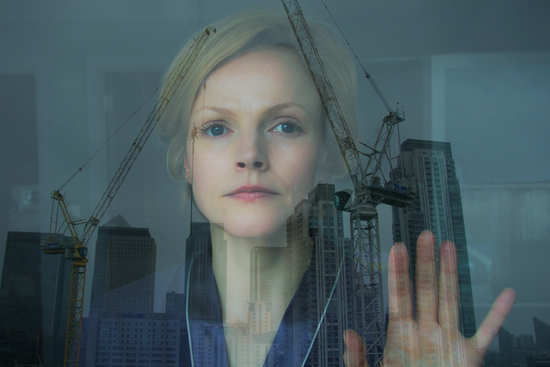 Maxine Peake stars as Charlotte, a career-obsessed workaholic whose world suddenly takes a bitter downwards turn, disintegrating further with the introduction of violent, psychopathic security guard Roger, played by Blake Harrison. As Charlotte's life becomes ever darker and twisted, we follow her journey into self-discover and atonement amid heart racing moments as she fights for a future that is Rosy. The independent thriller sees the directorial debut of award-winning advertisement director Steve Reeves, who has helmed over 400 commercials, best known for his Agent Provocateur advertisement starring Kyle Minogue - recipient of over 360 million hits on the web. Keeping Rosy is the third collaboration from producers Tim Phillips, Richard Holmes and Isabelle Georgeaux following foodie-comedy Jadoo, an official selection at Berlinale 2014, and Resistance, which saw Sharom Morgan win Best Actress at the 2012 BAFTA Cymru Awards. Editor Paul Watts (Under The Skin) and Academy Award nominated Director of Photography Roger Pratt (Harry Potter, The End of the Affair) also joined the team. The film's national release is on June 27th, where it will be screened at Picturehouse venues in London, and subsequently further Picturehouse venues across the country from July 15th.